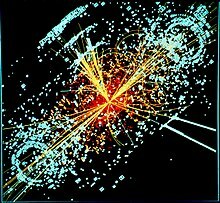 Should you place a bet that a Higgs particle has been found ? Why? Remember how a chain is only as strong as the weakest link? There are a couple of darn weak links in this chain of frenzied rumors. 1. Only a Signal – Not a Higgs. There was a weak signal seen at a mass/energy of 125 billion electronvolts in 2011 that almost everyone speaks of as though it is a Higgs particle. Even if the signal gains traction with the new 2012 data, there is no evidence that the signal has Higgs properties. For comparison a Proton “weighs” a bit less than 1 billion electronvolts (0.938 GeV). 2. The signal is so weak, its reality can’t be discussed outside statistical terms. As of today, the signal is about as convincing as Bigfoot videos. Even if the signal is confirmed, you will not see “film at 11” of the signal on late night news. Q: Is a Higgs particle important? A : Slightly. If one is found it might help us understand what we call the “Higgs Field.” This is a field (or a set of fields) that provides gravity and mass. “Q: Are particle physicists sure there’s a Higgs particle? ICHEP Higgs Rumours = Discovery ? This entry was posted in Basic Astrophysics, Fun, Particles and tagged Higgs Field, Matt Strassler, Particle physics. Bookmark the permalink.